Learn about one of our nation's historical heroes with this social studies worksheet featuring Abraham Lincoln. 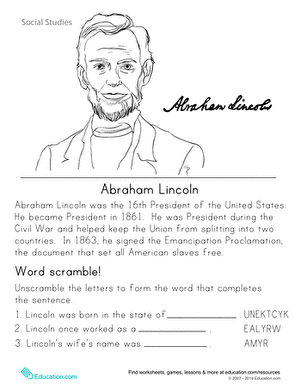 After reading about Lincoln's great contributions to our country, kids do a fun unscrambling activity to test their Lincoln knowledge. Read a short biography of Abraham Lincoln and answer the quiz questions.